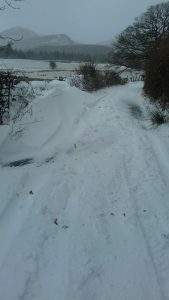 There’s been an awful lot of weather since I did my last post and I think everyone has stories about the Beast from the East. 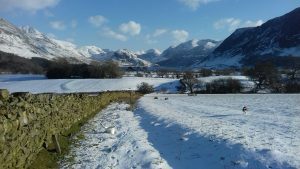 Here in Loweswater we are generally protected from the worst of snowy conditions by our proximity to the sea but we did get more snow than usual and as it was so cold it stayed on the ground and then the wind came and it drifted. It was difficult to get out of the valley for about three days but that was not really a problem. Our predominating wind is from the west and trees and their roots have grown in such a way to withstand this so such strong winds from the opposite direction has caused several trees and branches to come down. 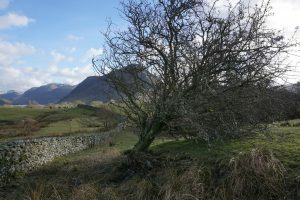 The hawthorn tree in the field in front of Foulsyke was one such casualty. However the sheep are now making use of the lower branches to have a good scratch! 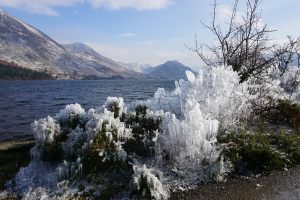 However on the Saturday after the snow the sun shone and I went down to Crummock and saw the most amazing ice sculptures along the wall by the pumping station. They were so beautiful. The Siberian weather was not the only event that week – we also had an earthquake, epicentre Mosser, can you believe that? 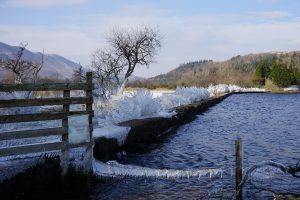 The Keswick to Threlkeld railway path is a delightful path by the River Greta steeped in history and enjoyed by many walkers and cyclists (it was part of the C2C route). It was very badly damaged by Storm Desmond: two bridges were washed away and a third left unsafe. There are now plans to restore it but it is going to be incredibly expensive. There are projects to help raise the necessary funds, one of which is the K2TChallenge. It sounds fun and I am thinking how I might participate. I have lots of happy memories of walking, cycling, pushing grandchildren in buggies along the path and it would be lovely to see it reopened again.